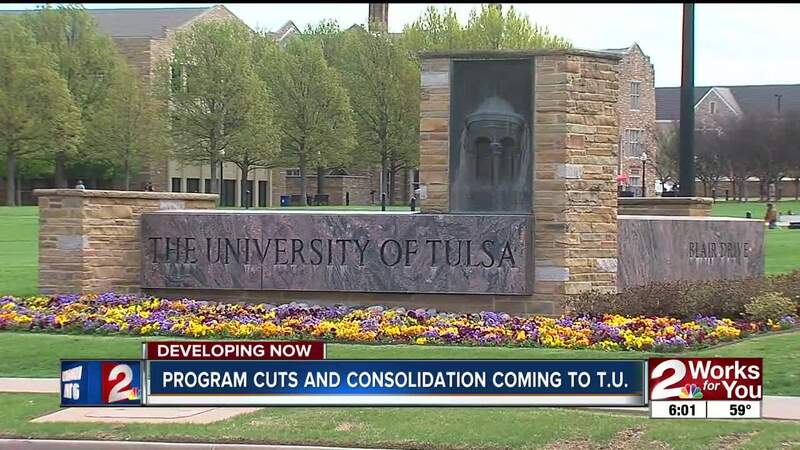 TULSA - The University of Tulsa will see major changes in the next couple of years after announcing program cuts and consolidation this week. The university plans to reduce degree programs by 40 percent, which will greatly affecting the liberal arts. Students and faculty from these programs tell 2 Works for You, they’re crushed by the decision and are worried about the direction the college is going. Jacob Patterson was heartbroken when he found out the theater program he just graduated from was being eliminated. “We always felt like we had a place to come back to at TU, and we don’t anymore,” Patterson said. Over the next two years, the university plans to cut nearly half the number of programs it offers. It sounds like a lot, but the school said only about 6 percent of the student body is majoring in those programs. TU said the changes are part of an effort to prepare them for a changing job market. The university said current and incoming freshmen majoring in the programs being cut will be allowed to finish their degrees. Patterson said it's not fair to the younger classmen currently enrolled in those programs. “Even if the programs are being phased out, with no more new students coming in, it’s really impossible for a theater program to last more than another year,” Patterson said. A professor at the college for more than 30 years, Jacob Howland was shocked when he heard the changes. "Not to be able to study philosophy and religion? These are the source of the great traditions that are at the heart of a liberal education," Howland said. "My interests are fed by the stuff that I teach and vice versa and that’s just being ripped away right now." Senior Philosophy major Jacob Lee said liberal arts education is important for everyone. “It’s what teaches us some of the deepest values in our culture," Lee said. "It teaches us to really be people and i think without this, the university really can’t aspire to much of anything." Howland along with other concerned faculty, students and alumni met Friday afternoon to decide on language for a petition and other action they may decide to take.